W616PDC Lufkin Pipe Diameter Tape in black, lightweight plastic case, 100ths. NOTICE: LUFKIN IS OUT OF STOCK ON THIS TAPE UNTIL THE END OF MAY 2019. Please see the Lufkin Diameter Tape w606pd or the Pi-Cobra Tape T217-6653. 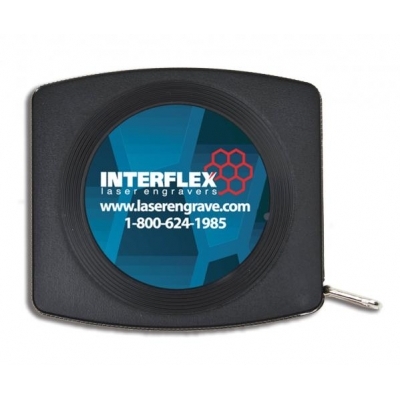 This tape features a 6' x 1/4" wide blade with an inch scale to 1/16ths. It's graduated to 1/32nds on the first 12" on front side of blade. Diameter in inches to 100ths on back side of blade. Blade style: A19 measures diameter up to 23". Convenient blank space before zero. Black, lightweight plastic case. Packaging: Gift boxed in brown craft box. Imprint area: 1 1/4" round white vinyl panel. Production: 10-15 business days (imprinted).